In these twelve riveting stories, the award-winning Chimamanda Ngozi Adichie explores the ties that bind men and women, parents and children, Africa and the United States. Searing and profound, suffused with beauty, sorrow, and longing, these stories map, with Adichie's signature emotional wisdom, the collision of two cultures and the deeply human struggle to reconcile them. "Affecting . . . The Africa in Adichie's collection isn't the Africa that Americans are familiar with from TV news or newspaper headlines. Her stories are not about civil war or government corruption or deadly illnesses. She is interested in how clashes between tradition and modernity, familial expectations and imported dreams affect relationships between husbands and wives, parents and children. In these stories, which take place in Nigeria and the United States, questions of belonging and loyalty are multiplied several times over. Her characters, many of whom grew up in Nigeria and emigrated (or saw their relatives emigrate) to America, find themselves unmoored, many stumbling into danger or confusion. Rather than becoming cosmopolitan members of a newly globalized world, they tend to feel dislocated on two continents and caught on the margins of two cultures that are themselves in a rapid state of flux. . . . The most powerful stories in this volume depict immensely complicated, conflicted characters, many of [whom] have experienced the random perils of life firsthand. . . . Adichie demonstrates that she is adept at conjuring the unending personal ripples created by political circumstance, at conjuring both the 'hard, obvious' facts of history, and 'the soft, subtle things that lodge themselves into the soul.'" "Haunting . . . In the first of these 12 stories set in Nigeria and the U. S., a spoiled college student doing a stint in a Nigerian prison finds he can't keep silent when the police harass an elderly inmate. In another, what seems like an excellent arranged marriage is doomed once the bride joins her husband in Brooklyn and learns he's an overbearing bore. And for the lonely narrator of the title story, falling in love means 'the thing that wrapped itself around your neck, that nearly choked you before you fell asleep,' is finally loosened. Adichie, a Nigerian who has studied in the U. S., writes with wisdom and compassion about her countrymen's experiences as foreigners, both in America and in their changing homeland. Here is one of fiction's most compelling new voices." "Imagine how hard it must be to write stories that make American readers understand what it might be like to visit a brother in a Nigerian jail, to be the new bride in an arranged marriage, to arrive in Flatbush from Lagos to meet a husband or to hide in a basement, waiting for a riot to subside, wondering what happened to a little sister who let go of your hand when you were running. How would it feel to be a woman who smuggled her journalist husband out of Nigeria one day and had her 4-year-old son shot by government thugs the next? If reading stories can make you feel . . . caught between two worlds and frightened, what would it be like to live them? This is Adichie's third book, and it is fascinating. . . . Characters (many in their teens and early 20s) feel a yanking on invisible collars as they try to strike out on their own. Sometimes, ties are cut by distance, leaving a protagonist disoriented and alone . . . Sometimes a lie or a death cuts the lines of trust that tie a character to the world they inhabit. Most of Adichie's characters are alone, adrift in a strange physical or emotional landscape. . . . These characters feel invisible, erased. They can't go home. They want to melt into America. What would it be like to feel that sinister thing, memory, around your neck? Perhaps you can imagine after all." "Don't let Adichie's highbrow resume scare you away from her accessible and compelling short-story collection. Yes, the 31-year-old Nigerian writer won a 2008 MacArthur Genius award. But unlike many literary authors, she eschews pretentious obscurity in favor of clarity. In these stories set both in Nigeria and in the USA, she touches on religion, corruption, Nigeria's civil war and living in America as a lonely African wife. Mostly, however, she creates indelible characters who jump off the page and into your head and heart." "Wonderfully crafted . . . Prose this skillful deserves international acclaim. Insightful, powerful and brimming with characters that seem to leap from the printed page, this collection is nothing less than a literary feast." "The tensions embodied in [the story 'Jumping Monkey Hill']—between fiction and autobiography, the expectations of the observer and the experience of the witness, not to mention the value of certain experiences in the global literary marketplace—practically seep through the pages of this collection. As a whole it traces the journey Adichie herself has taken. . . . All [her] personhoods are represented here: the sheltered child, the vulnerable immigrant in Philadelphia and Brooklyn, the foreign student adrift in a dormitory in Princeton, the young African writer asked to objectify herself for an uncomprehending audience. . . . 'Ghosts,' in which an elderly professor in Nsukka meets an old colleague he assumed had died in the Biafran war, is a nearly perfect story, distilling a lifetime's weariness and wicked humor into a few pages. 'Tomorrow Is Too Far,' a kind of ghostless ghost story, delves beautifully into the layers of deception around a young boy's accidental death . . . And there is a whole suite of stories in which Adichie calmly eviscerates the pretensions of Westerners whose interest in Africa masks an acquisitive, self-flattering venality. . . . Adichie is keenly aware of the particular burdens that come with literary success for an immigrant writer, a so-called hyphenated American. Though she strikes a tricky balance—exposing, while also at times playing on, her audience's prejudices—one comes away from The Thing Around Your Neck heartened by her self-awareness and unpredictability. She knows what it means to sit at the table, and also what it takes to walk away." "Adichie belongs to the rare group of young writers whose wisdom sets them apart from writers of their age. . . . The Thing Around Your Neck once again showcases her insights into human nature under social, ethical, cultural as well as personal dilemmas. . . . In her notes about novel writing, Elizabeth Bowen emphasized both the unpredictability and the inevitability of a character's actions. Adichie' s best stories are perfect examples of her masterful perception of these seemingly conflicting qualities within human nature. I hesitate to use 'create,' as Adichie' s characters don't feel as though they were merely created; rather, it is as if they were invited into the stories by the most understanding hostess, and their dilemmas, pains and secrets were then related to us by the hostess, who seems to understand the characters better than they understand themselves, who does not judge them, and who treats them with respect and love and empathy that perhaps they would never have allowed themselves to imagine. . . . Reading ['On Monday of Last Week'] is like taking a journey of having one's heart broken in a foreign land, yet it is not the foreignness of the land that brings the pain but the foreignness in any human heart. . . In this and a few other stories about Nigerian women who have found themselves in America, Adichie transcends the norm of immigrants' stories and give the characters complexities that would be absent in a less masterful storyteller. . . . 'The Headstrong Historian,' a story that encompasses four generations of women (and men), achieves what a short story rarely does, with a symphonic quality that one would only hope to see in a master's stories, like those of Tolstoy. . . . Together these stories once again prove that Adichie is one of those rare writers that any country or any continent would feel proud to claim as its own." "Haunting . . . Adichie deploys her calm, deceptive prose to portray women in Nigeria and America who are forced to match their wits against threats ranging from marauding guerillas to microwave ovens. . . . The devastating final piece, 'The Headstrong Historian,' seems to carry the whole history of a continent in its bones: tragic, defiant, revelatory." "Like those of Jhumpa Lahiri, whose work bears a notable resemblance to Adichie's, the characters of The Thing Around Your Neck are caught between past and present, original and adopted homelands. . . . America is a land of yoga classes, drive-through banks, and copious supermarket carts, but it is also a surprisingly unsatisfactory promised land . . . a place where half-truths and buried secrets that form a life are ruthlessly exposed. [Here also is] Nigerian life seen from the outside: the perspective of the American immigrant, the memory tourist, the second-class gender. They are the stories of those whose tales are not told. Adichie deftly accesses the privileged mindsets of her Nigerian characters, who stubbornly insist on believing that they are to be protected from the worst. . . . Her Americans are outsiders clamoring to be let into society; her upper-class Nigerians are insiders clamoring to be let out of history. 'It would have been so easy for him,' [one] narrator observes on the occasion of her brother's release from prison, 'to make a sleek drama of his story, but he did not.' Nor does Adichie, who prefers ambiguity, and a certain abruptness of tone, to the carefully raked garden paths of other writers. . . . Whether these stories reflect the writer's own experiences, only Adichie knows. That they reflect the lives of her countrymen, there can be no doubt." "There are various ways writers can be ambitious, but in our era they are often judged to be so only if their prose is complex, elusive, and somewhat arcane. The Nigerian writer Adichie is an exception to this 'rule.' She's a deeply ambitious and justly celebrated writer whose prose is lucid and whose narrative method is simple and straightforward. Indeed, the 12 clearly told tales that make up The Thing Around Your Neck resonate powerfully because of their thematic depth and their author's ability to understand and reveal her characters. [The collection] explores the frequently troubled lives of Nigerians in their native country as well as those trying to adapt to life in America. Often these stories involve a conflict between personal fulfillment and political commitment and/or fidelity to one's roots. . . . The theme of the displaced African, confused and alienated in America in an almost Alice in Wonderland-like way, recurs in a number of these stories. . . . While Adichie's vision of America is often bitterly comic and sometimes scathing, she is equally, if not more, critical of the injustice and violence that pervades Nigeria. 'Cell One,' for example, is a kind of broken family romance told from the daughter's point of view that centers on the increasingly dangerous behavior of her 17-year-old brother. [It] is, perhaps, the most successful instance of Adichie' s enriching her story by adding a social dimension to it, maintaining all the while a fine balance between the personal and political. . . . While many of her characters are suffused with sorrow, they also generally evolve enough to make decisions that can help their lives. . . . For Adichie, hope lies in taking action, as indeed she herself did in writing this poignant, compelling book." "Powerful . . . Arresting. The distilled world of the short story suits Adichie beautifully: She shows a rare talent for finding the images and gestures that etch a narrative moment unforgettably in the reader's memory. . . . Many of the characters in the book divide their time between Nigeria and the United States. A very solid collection, [one that] resonates with an aching undercurrent of dislocation and loss of identity. . . Exquisite stories that will take you to places you didn' t know existed." "Powerful, deftly assembled . . . Adichie's gifts as a storyteller [are all] on display . . . The backgrounds of her characters may initially seem exotic to Western readers. And yet the love, justice, and understanding they seek are so fundamental and familiar that there are few readers of any background who won't recognize acres–perhaps even miles–of common ground. Here, Adichie's characters are as likely to inhabit Hartford or Princeton as they are Nsukka or Lagos. . . . But all in some way are in a state of loss. . . . For most of them, there is a loss of wholeness, thrust upon them by both the discomfort of their own country and the powerful pull of Western culture, into whose orbit they seem constantly to be sucked, whether they have ever actually set foot outside Nigeria or not. . . . Adichie's gift to readers in this book is to give voice to some of the forms of Nigerian heartbreak that Westerners might not otherwise hear. But despite the deep hurt that ripples through these stories, the characters never shout out their sadness. If they are alive, they know they are fortunate. If they are sad, they hold it within. Wisely, Adichie mostly keeps away from politics. Her stories are not a condemnation of the West or the US. Instead, Adichie gives us what a first-rate writer should: a keen yet poignant view of the contradictions of the human condition." "Remarkable . . . I congratulate you on this book. It is so moving and powerful–each of these stories you have written." "These 12 well-written short stories are provocative in their portrayal of women and men in crisis, and satisfying in their finality. . . . A finely crafted, compelling and satisfying set of stories." —Lois D. Atwood, The Providence Journal "The immigrant experience, that endlessly complicated balancing act between longing for acceptance and resisting pressure to just shut up and be grateful for your green card, is rich terrain for fiction that explores the tensions that arise where politics and the personal intersect. The celebrated writer Chimamanda Ngozi Adichie, 31, knows this terrain well. . . . In the dozen stories in The Thing Around Your Neck, Adichie writes with great sensitivity of the struggles of Nigerian immigrants to forge an identity in the modern world without discarding the values of their culture of origin. Violence casts a long shadow over the collection. A few stories explore the frustration of trying to make an arranged marriage work in a new country. [One character says of America,] 'It forces egalitarianism on you. You have nobody to talk to, really, except for your toddlers, so you turn to your housegirl. And before you know it, she is your friend. Your equal.' Virginia Woolf could not have said it better. . . . Whether they live in Nigeria or the U. S., the women in Adichie's stories do not have it easy. One thing they do have, though, is brains. Their suffering is all the more poignant because, deep down, they know the price you pay for not doing what you want in life is incalculable." "You know it when you see it: the ability to conjure whole lives, times, places, worlds in a few deft splashes of prose, Picassoesque line drawings of the mind, without resort to attitudinal or perspectival gambits, language games, postmodern devices. Plenty of people have recognized the sure-handed literary classicism of Nigerian writer Chimamanda Ngozi Adichie. Now comes a dozen stories, half set in Nigeria and–in a creative departure for Adichie–the other half in America. The characters in the stories set stateside are stymied by home ties and bemused by America. The coloration and vigor [in those stories] rarely pale, and Adichie's supple talents are on full display in her African tales, which never fail to touch the universal in the particular experience of the aging revolutionary professor, the fallen bourgeois golden boy, the shopping-crazy gal caught up in a marketplace massacre. Like most of us–but perhaps more so–Adichie's imagination seems fired by nostalgia for a lost childhood world at least as much as by the challenges of the ever-moving present tense that has swept it so unceremoniously, irretrievably away." "The stories in The Thing Around Your Neck are so exquisite they grab you by the throat and stop your heart." "Bold, fearless, and completely unapologetic . . . Many of the book's main characters are women, women who are filled with longing, regret, sadness. The men in their lives are a disappointment; America is an even bigger one. . . . The immigrants who come here are stifled, they have to make great sacrifices, huge compromises. . . . A few of the stories in the collection even feature gay characters, a no-no in African literature . . . Adichie' s biting humor shines through in the tale 'Jumping Monkey Hill.'" "Adichie embodies a literary cosmopolitanism as expansive and mellifluous as her name: she offers tales that make world literature from American fictions. . . . In The Thing Around Your Neck, [she] maps narrative possibilities for examining postcolonial Nigeria, the haunting ramifications of civil war and government-sanctioned terrorism, and the aching process of immigrant acclimation to the United States. . . . In stories like 'Ghosts' and the outstanding title story, Adichie suggests that what lies ahead or abroad [for Nigerians] may not offer protections from history's indignities. . . . Adichie displays strong control of the short form. . . . 'The Headstrong Historian' is a perfect representation of the author's great imagination and skills . . . Adichie's abilities to compress and drive the narrative dazzle us." "Fiercely sympathetic tales of Nigerian expatriates who find themselves alienated on both continents." "Beautifully crafted . . . As Baltasar Gracián, a 17th-century Spanish writer, once wrote, 'Good things, when short, are twice as good.' This compressed kind of pleasure is abundantly evident in [The Thing Around Your Neck]. Adichie has attracted a lot of attention in her relatively short career . . . This book will show you why." "Packing a full world into a few paragraphs is precisely the short storyteller's challenge, the task Adichie has set for herself in this [collection]. This young Nigerian writer proves herself worthy of the challenge, building a rich universe in both broad and subtle strokes. . . . Certainly [these stories are] strong enough to stand alone. But the cumulative effect for an American reading them is a history lesson injected with emotional immediacy. Adichie examines lives interrupted by the onset of civil war in the late 1960s. She dramatizes the anxiety of Nigerians waiting to hear if their loved ones were aboard the plane that crashed after takeoff from Lagos in 2004 and killed everyone on board. . . . Adichie's final story, 'The Headstrong Historian,' is well-placed. It offers a reckoning of Nigerian history in the character of Afamefuna, whose understanding of her grandmother's life provides insight into her own education and upbringing away from the tribe. . . . Haunting." "Half of a Yellow Sun was the kind of protean work that seemed impossible to follow. . . . The Thing Around Your Neck has [the same] lyricism in common with her last book, but rather than being focused on the past, it brings contemporary issues of politics and immigration into sharp focus. . . . The most successful stories in the book concern problems of immigration and shine an often harsh light on America and Americans while portraying the seemingly contradictory love affair the world continues to have with our life and customs. . . . Her view of Africans is no less unsparing. . . . Adichie' s narrators have in common the diction of outsiders, always standing apart from others, even those with whom they might claim solidarity. . . . What's on display in these stories is a fierce imagination and dazzling use of language that marks Adichie as a writer of impressive reach and achievement. . . . There's no question that this is a writer to watch, one from whom we can expect great things in the future." "Nigeria has produced such talented writers as Wole Soyinka and Chinua Achebe. To that list we can now add Chimamanda Ngozi Adichie, whose accomplished collection, The Thing Around Your Neck, further burnishes her considerable reputation. . . . She makes observations of the immigrant experience that are affectingly acute. . . . These are powerful stories by a masterful writer that perceptively evoke the less celebrated aspects of immigration–loss of place, familiar comforts and unquestioning acceptance by others–as well as of the toll of pervasive authoritarianism back home." "Compelling, often emotionally wrenching . . . Intriguing . . . Adichie writes of the immigrant's experience of coming to the U. S. from Nigeria and the social and physical consequences that precede and follow. . . . A revealing outsider's view of America appears in many of these stories . . . Adichie deftly pulls much from her native country's troubled past and present, turning it into high and intimate drama . . . Adichie's stories show more of the difficulties and less of the pleasures of everyday life in Nigeria and what it means to leave that life for America: Neither choice is easy, both have dangers. . . . Her words and stories are insightful and provocative and tell us much about the human experience in difficult times." "These 12 stories by Nigerian—born Adichie provide a wise and minutely observed update of the American-immigrant experience. Her narrators, most young African women, navigate the exotic terrain of New Jersey and Pennsylvania, their perceptions sharpened by homesickness. Macy' s, for instance, can take on the eerie grandeur of an imperial palace." "Dazzling . . . Witty . . . One of the finest [collections] ever written by an African writer. . . . Like [Chinua] Achebe, Adichie is an astonishing Ibo writer who grew up in eastern Nigeria, but unlike her literary parent, Adichie has veered off into territory that is often remarkably different from Achebe's. Moreover, her worldview has been indelibly shaped by her gender . . . Adichie [has] emerged as a strong voice, worthy of our attention. . . . One of the most original of these stories, 'The Headstrong Historian,' reveals why so many of her readers believe Adichie is Achebe reborn. . . . But then once Adichie has got us hooked, she steps into her own shoes and takes the reader on a trip that I doubt even Achebe (for all his brilliance) would have ever imagined. What a delicious surprise. [Adichie] hasn't eliminated her literary father but she has discovered her own territory. [This story] heralds not only her own voice but her genuine craft as a writer of prose narratives. . . . There's no telling where she'll go next." "Ask most Americans what they know about Nigeria and they may be hard-pressed to mention anything beyond oil production and scams on the Internet. Adichie knows far more, and her writing about her homeland and its emigrants to America illuminates this powerful African country. The Thing Around Your Neck focus[es] mainly on middle-class Nigerians struggling with issues of love, class, war, homeland and loneliness [and it] offers a window on a country and a people that Americans would do well to understand better. . . . Many of the stories involve Nigerian women caught between old country customs and new world ways, whether in their home country or as immigrants to America. Adichie, whose prose is both precise and evocative, gracefully shows us how the particulars of their experiences fit into the universal struggles of women the world over." "Absorbing . . . The Thing Around Your Neck revolves around questions of identity in an era of globalization. We live in a world of ethnic neighborhoods with hazy geographic borders, a world of immigration, diasporas, and hybridizations. The 'things' hanging around all of our necks are complicated strands of social, cultural, religious, and historical roots that gradually weave into the core of one's self. [Adichie's] fiction furnishes a wider panorama of life, including but surpassing the political. . . . Adichie's lyrically written stories frequently depict the elements of competing religious perspectives that are such a central part of Nigerian life today. . . . Faith is a central part of what it means to be a global citizen in today's flat world. Adichie's potent fiction helps us to recognize the truth and the lies, the connections and the divisions, that characterize our time." "The master storyteller weaves a dozen insightful tales set in war-ravaged Nigeria and America, where violence continues to escalate." "Whether [Adichie's] characters are finding trouble in their home country of Nigeria or as immigrants in America, they all face difficulties in establishing themselves as a known commodity and figuring out where they stand within the socio-economic and social system in which they are living. Adichie writes deeply but without being overbearing. [Her] writing lacks pretension and avoids the plea for emotion that leads many of today's writers to create melodramatic novels of heartbreak and loss. Instead, Adichie achieves an understated emotional rawness which leads to powerful fiction." "Searching . . . Adichie displays a deft feel for the texture of violence. . . . This collection [is] concerned with how large forces–violence, tradition, immigration, colonialism–shape and determine individual lives. . . . The emotional weight of The Thing Around Your Neck derives from the feeling of ambivalence about opportunity in America and the chaos of modern Nigeria that's built up through the whole collection– the real 'thing' around the characters' necks . . . Adichie, who splits time between Nigeria and the U. S., has likened America to 'a very rich uncle,' and her stories are infused with the curiosity, admiration, and aloofness characterizing that perspective. . . . Adichie [has a] feel for the traditional sensations of Nigerian life, the fragrant jacaranda blossoms, warm harmattan breeze and 'yellow-bellied bees' that buzz in the afternoon." "In Adichie's meticulously detailed stories of Nigerians at home and abroad, national identity functions as both a pendant and a millstone, alternately blessing and burdening its wearers. One of Adichie's greatest gifts is her ability to sketch the lives of her characters (mostly women), and to limn the differences between Nigeria and the United States with a few telling details. . . . A lesser author would take the easy road of broadly painting these cultural differences so that one culture came across as superior to the other, but Adichie seldom falls into this trap. Her expatriates miss Nigeria even as they criticize the way that women are treated there and come to enjoy certain aspects of American culture despite the difficulties of assimilation. The two strongest stories, 'On Monday of Last Week' and 'Jumping Monkey Hill,' probe even deeper by creating complex characters who address these issues head-on, with nary a shred of didacticism or spoon-fed multiculturalism in sight. . . . 'On Monday of Last Week' expertly juggles weighty themes by focusing on character rather than trying to deliver a message. Likewise, 'Jumping Monkey Hill' uses a sophisticated structure and finely drawn characters to convey the power politics at play in the African writing community." "An assured and insightful voice whose work can stand alone . . . Adichie' s prose is unflinching, eschewing metaphor for the simple power of calling a thing as it is. . . . The best [stories] are disquieting for their lack of resolution, ending on the inhale rather than the exhale. Ultimately, The Thing Around Your Neck is less a tour of postcolonial scars than it is about humans who bang into each other on their way to getting what they want. In this way, Adichie follows in the footsteps of Jhumpa Lahiri." "As richly modulated as MacArthur fellow Adichie's hard-hitting novels are, her short stories are equally well-tooled and potent. As her first collection arcs between Nigeria and the U. S., Adichie takes measure of the divide between men and women and different classes and cultures. A meticulous observer of tactile detail and emotional nuance, Adichie moves sure-footedly from the personal to the communal as she illuminates with striking immediacy the consequences of prejudice, corruption, tyranny, and violence in war-torn Nigeria and unaware America. . . . Adichie's graceful and slicing stories of characters struggling with fear, anger, and sorrow beautifully capture the immense resonance of small things as the larger world pitches into incoherence." "A fine new collection . . . set in both the United States and Nigeria, where things continue to fall apart. A privileged college student gets involved in gang violence; innocent women flee from a bloody riot; some characters are visited by ghosts, while others are haunted by the memory of war. Yet as one character puts it, an easier life in the United States is cushioned by so much convenience that it feels sterile. Relations between the races are awkward at best. . . . Adichie, a brilliant writer whose characters stay with you for a long time, deserves to be more widely known." "The title of Chimamanda Ngozi Adichie's short story collection intrigues even before you open the covers. . . . Adichie has written of gang violence and police brutality in her native Nigeria, of deceived wives and old men remembering the Biafran war, and of a Muslim and a Christian woman forming a momentary bond while religious riots rage outside their hiding place. Adichie's spare, poised prose, the coolness of her phrasing, ensures these scenes are achieved without melodrama. And though she writes very specifically about Nigeria, the stories have a universal application. . . . 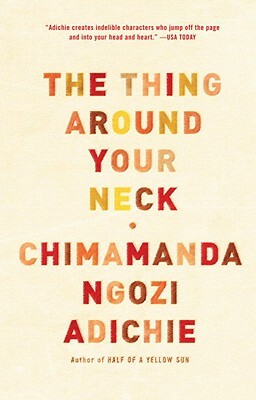 The Thing Around Your Neck explores myriad tensions between new world and old. . . . [Adichie's] tales explore an array of power struggles, and often the story's kick comes from the shifting of that power, the moment of realization or choice that will result in changed lives. It's the hint at these lives beyond the final lines that reminds one of what a good novelist Adichie is. There are many characters you would like to travel with further." "Adichie, a classic storyteller, expertly limns the lives of Nigerian women and their families, both in their mother country and in their adopted U. S."
"A dozen stories about the lives of Nigerians at home and in America from the winner of the Orange Broadband Prize. In the five tales set in the United States, Adichie profiles characters both drawn to America and cautious of assimilation . . . The very fine 'Jumping Monkey Hill' and the title story both show Nigerian women confronting white expectations. . . . Insightful and illuminating." "Extremely rewarding . . . Adichie's growth into one of the language' s most powerful storytellers is palpable [as her] language ascends to the level of the best writers, both compressed to a minute grain, and yet expansive in the way only finely wrought short stories can be. . . . The integrity of the author, as she tackles the core morality of [her themes], is in full evidence. We can clearly see where her strengths, in style and content, ought to lead her in the future. This is both the roadmap of an unfolding major career, as well as a view of the library which got her here." "I have a thing for short stories that lend insight into the lives of immigrants caught between two cultures. My favorite writers in this category have been Jhumpa Lahiri and Sana Krasikov. Now I'm adding the Nigerian-born Chimamanda Ngozi Adichie. [The Thing Around Your Neck] is beautifully written and heartbreaking. I'm halfway through it. I want to race through it because each story so far has been so powerful. And yet I want to go slowly, to savor her bringing me over to Nigeria and then back to the US, getting a glimpse of what it' s like to be stuck in the middle, between the old and the new, the home of the heart and the home of the future." "This stunning collection confirms Adichie's position as one of Africa's brightest new literary stars. She is the author of two important novels about the Igbo people of Nigeria . . . yet her writing is even more poignant when applied to the short story: crisp, succinct, vigorous and loaded. . . . These slice-of-life stories straddle both [America and Nigeria] and dissect the imbalance of power and moral corruption in a wide range of relationships and settings. The first story, 'Cell One,' shows a descent into lawlessness and police brutality that we've come to expect depicted in Nigerian literature. Yet in Adichie's hands it is seen afresh. The writer's cool, intelligent, observant, female antennae are sensitive to the subtleties of how people behave, and why, in this story about the interplay of motherhood and teenage waywardness. . . . It is to Adichie's credit that her writing is so understated that at the end of the story the reader is left to imagine what happens rather than being force-fed the gory details. Her endings are always unpredictable and suspenseful. In 'A Private Experience' two women take refuge in a shack in the middle of a riot . . . Their brief interaction affirms the power of humanity to resist and survive tribal warfare. All Adichie's stories are suffused with evocative atmospheric detail. . . . While there is a sense of anger at the injustices that Nigerians have to endure in their home country, these stories also question whether life in the US is any better. Many of the immigrants' stories are driven by loneliness and alienation and some do decide to return home–for better or worse. Adichie offers insights into both worlds and, like all fine storytellers, leaves us wanting more." "Confirms [Adichie's] status as a first-rate storyteller. In the sublime title story, a young Nigerian émigré, a winner of an American visa lottery, expresses her choking loneliness as she scrapes for a living and for love in Connecticut . . . These sparkling stories explore loneliness, identity, violence, betrayal, middle-class obsessions, the bond between parents and children, and the emigrant and colonial experiences. [Adichie] casts a fearless and caustic eye on the corruption that Nigerians endured under a military dictatorship and on what she perceives to be the fatuousness of the American way of life. . . . Fans of Adichie's novels won't be disappointed, because each of the 12 short stories in this book is a mini-novel to which readers can add their own twists, turns and outcomes." "Adichie's [stories] are as nuanced and well written as any I've encountered in recent years. You'll be entertained, enlightened and come away a better person after reading this collection that toggles between [Nigeria and the U. S.], the clash of cultures, the divides between men and women and the different social classes in both countries. . . . ['The American Embassy'] will enlighten and touch you more than a dozen news stories. . . . The humor in ['On Monday of Last Week'] is nuanced and brilliantly demonstrates the versatility of the author. . . . Another story suffused with comedy, 'Jumping Monkey Hill,' brings together a diverse group of Africans in a writer's conference in South Africa [and is] a story that will resonate with writers and possibly members of book groups. I've already decided that The Thing Around Your Neck belongs on my list of notable books of 2009. If you want short stories that you'll remember for a long time, read this collection. You'll find yourself rereading the stories, to catch the subtleties you may have missed the first time around, to glory in the work of a young writer who has mastered a difficult art form." "There is an understated beauty to Adichie's deceptively simple prose: it remains cool, dispassionate and controlled, and leads you easily through unfamiliar and unexpected scenarios. . . . The Nigerian stories, and 'Ghosts' in particular, offer windows on experience that radiate with compassion. . . . There is a lyrical ache in this simple tale that recalls Gabriel García Márquez's beautiful novella Nobody Writes To The Colonel–quite an achievement for such a young writer." "Superb. With minimal fuss [these stories] present snapshots of Nigerian life. . . . The title story tracks the life of a young woman sent to the US by her family . . . It is memorably, heartbreakingly sad . . . Both as a person and a writer, [Adichie] is engaged in an ongoing project of rebellion against the expectations of others–of those who want to be able to tell her what the world is like, and what her place in it should be." "The strains and betrayals involved in fleeing one culture for another figure prominently [in The Thing Around Your Neck] with the uprooted heroines caught between the devil of a dysfunctional homeland and the deep blue sea of suburban America. Adichie has a flair for drama, particularly where violence is involved. Not too many writers could carry off a beheading with [her] confident, mid-sentence insouciance . . . The writing throughout the book has a verve that propels you forward through its pages. The polarities Adichie explores– Africa/America, black/white, male/female, master/servant–are very efficiently laid out, gridded over each other in unexpected ways, with power and weakness constantly switching positions. And a pervasive, lightly mocking intelligence gives the whole thing a lively, satirical edge." "Adichie grew up in Nigeria; she now lives in the United States. Several stories in her new book engineer a kind of moralizing comedy by viewing one country from the perspective of the other. . . . An elegant collection. From beginning to end the prose is serene and the characterization deft." "A vivid new collection by Adichie . . . In the tense and dramatic 'A Private Experience,' two women, a young Christian Igbo girl from Lagos and a poor Muslim Hausa woman from the north, take refuge from a street riot in an empty shop and share lessons in survival. 'Ghosts' [is] an accomplished and powerful story about honour and regret [that] sounds a long sad chord from the small world of the elderly, gently gathering wider implications into its brief compass. . . . [The stories set in America are] full of telling contrasts between the new world and 'home.' . . . The most sophisticated story in the collection is 'Jumping Monkey Hill,' which features an old English post-colonial couple who run an African writers' workshop outside Cape Town. [It] has a wryly humorous story within a story, and ends, like many of the tales here, with the protagonist walking away from compromise. Whether in the land of the free or under military rule, women are the main victims–of casual lechery, arranged marriages, cheating husbands and violence. When women talk to each other they share more than gossip and information; they are bound together in powerlessness. The long final story, 'The Headstrong Historian,' a compact tragic family saga, ends on a faint note of hope with an educated granddaughter. . . .With its warm and sympathetic heroines and its finely cadenced prose, this collection demonstrates that [Adichie] is keeping faith with her talent and with her country." "The success of [Half of a Yellow Sun] cemented Adichie's status as an incredibly gifted storyteller and her stories add further confirmation. Adichie's work is reminiscent of that of novelists Amy Tan and Jhumpa Lahiri in that her fiction is largely concerned with the clash of cultures and the immigrant experience in America. Like the author's life this collection is divided between America and her west African homeland. Each is a perfect nugget, telling a complete story in some 20 pages. Simple but beautiful, the stories tackle everything from corrupt police and riots to infidelity and arranged marriages. While she writes of Nigeria with affection, Adichie never sees it through rose-tinted spectacles. . . . The stories are compelling and diverse but make up a mere 218 pages–leaving the reader wanting more from this major African talent." "A fortunate few writers possess the rare but unmistakable quality of inspiring a reader's confidence within a few sentences. It is a curious, almost unliterary trait: like meeting a person whom one knows is going to become a friend. The secret is not one of content or style (though Adichie is a stylist of deceptively effortless grace who seems to manipulate language almost invisibly, so that it is only later that her careful craftsmanship becomes apparent). Her particular gift is the seductive ability to tell a story. Adichie's narratives have something of the compelling allure– at once intimate and strange–of a crossed telephone line. It is as though the reader has dropped into the lives of her young women (the majority of her narrators are young and female) and become immediately absorbed into their imagined world. . . . Her characters have the power of archetypes and the verisimilitude that comes from fine observation. . . . Adichie writes with an economy and precision that makes the strange seem familiar. She makes storytelling seem as easy as birdsong." "Almost every story [in The Thing Around Your Neck], in the way only the most satisfying short stories manage, holds the kernel of something bigger in its fist yet is simultaneously a fully realised, standalone entity. They don't aspire to be novels–that would be a bad thing–but they hum with potential. I longed to know more about each struggling, grieving character as I turned the last page of each compact and uncompromising tale. And I mean that as a compliment. Adichie is already, at the age of 31, a formidable voice in contemporary west African literature, described by Nigerian heavyweight Chinua Achebe as 'a writer endowed with the gift of ancient storytellers.' In the title story that gift is skilfully employed in her use of the second person tense, not easily pulled off . . . Even when describing something horrific, Adichie remains dispassionate and the control and distance she maintains are what make her such a good writer. . . . At its best Adichie's prose can be breathtaking in the most literal, physical sense. . . . In both [the U. S. and Africa], Adichie's preoccupation is with class, and this is why her voice is so refreshing. Her interests lie in middle class Nigeria and the diaspora, and she tugs us out of the one-dimensional representation of Africa–the poverty, disease and civil war–that we are usually fed."